Recently in October 2013, Tropical cyclone Phailin struck the coast of Odisha and Andhra destroying many homes, lives and caused loss of property. It originated in the Gulf of Thailand and gradually grew in intensity as it moved over Andman Sea in Bay of Bengal. It was a Category 5 storm with 200 Kmph winds and rainfall. Tropical Cyclones are low pressure systems that are formed over the warm tropical waters due to gale force winds (winds of tropical force i.e in the range 200 kmph or greater). They generally extend hundreds of kilometer and generally persist for six hours. However they die out when they travel through land & Cold Ocean or cold area. Many people call tropical cyclone by various names; such as hurricanes, typhoons or cyclones. It depends on the location of the storm. But the scientific name is “tropical cyclone”. Storms that flow over Atlantic Ocean or eastern Pacific Ocean are called “hurricanes” (Hurricane in the Atlantic, Typhoon in the Pacific and Cyclone in the Indian Ocean). Circular Eye: It is the centre of tropical cyclone. Owing to its round shape, its size is generally expressed in diameter which ranges from 10 -100 km. 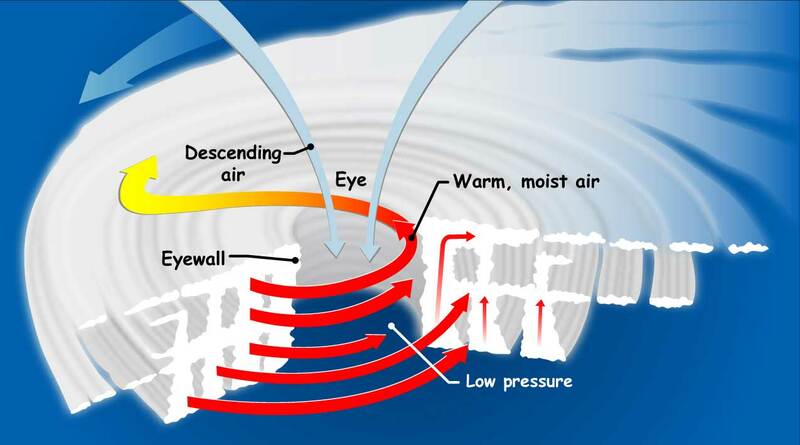 Eye wall: Circular eye is surrounded by thick ring of cloud called eye wall. Area under it experiences extreme winds & heaviest rainfall. Generally when the winds in the rotating storm have the speed of 39 mph then they are called tropical storm & when the speed reaches 74 mph it is called tropical cyclone. Tropical Disturbance: It has weak wind circulation & low velocities. Tropical Storm: It is a moderate tropical cyclone with maximum wind speed of 118 kph. Typhoon: It is an intense tropical cyclone with maximum wind speed exceeding 118 kph. Very large ocean areas with surface temperature more than 26 C.
They need warm tropical oceans to feed them energy without which they will cease to exist. Tropical cyclone can exist only when there is proper combination of circulation, divergence and convergence of air which is maintained over a considerable period of time on a proper scale. Formation of tropical cyclones can be explained by convective theory or the frontal or counter-current theory. - a large mass of air becomes convectively unstable and moist compared with its surroundings, which results in an upward motion of air. - The air from the surroundings tend toward the low pressure area formed, so that, a cyclonic circulation is formed. - The combined effects of the earth's rotation and the centrifugal force, retards the movements of air towards the center causing further pressure fall. - The process continues until a vigorous cyclonic wind system is developed. Likewise, the outward flow of air from the center at high levels also makes the pressure lower. - many tropical cyclones form along the front between the trade winds and the equatorial air in the doldrums. - Winds develop along this front and when conditions are favorable, forms into tropical cyclones. - The convergence of the two air masses results in the upward motions which in addition to the deflective effect of the earth's rotation, centrifugal force, and divergence at the upper levels results in allow pressure area with a spiral circulation toward the center. This is the starting stage. Circulation centre is not well developed. So the intensity is less and it generally tends to move inland but doesn’t cause much damage. Area of convection becomes more organized, intensity increases and the minimum surface pressure drops below 1000 hPa. Convection winds organizes itself into a wind which spiral inwards. Due to well developed circulation, “eye” begins to form. Damage caused by it is severe but the area covered is small. cyclonic circulation and extent of the gales increases. There is only random fluctuations in central pressure and maximum wind speed. It has a well developed eye. The warm core is destroyed during this stage, the central pressure rises, and the belt of maximum wind expands away from near the centre. Decay may occur very rapidly if the system moves into an unfavorable atmospheric or geographic environment like on land or cooler water surface. 1 Formed in mid-latitudes i.e. 40 degree to 60 degree North and South. Formed in lower latitudes i.e. 10 degree to 30 degree North and South. 2 Formed due to convergence of the warm (tropical) and Cold (Polar) air masses. Formed due to the convergence of warm dry and warm moist air masses. 3 The isobars of temperate cyclones are Wedge shaped or oval shaped. The isobars of tropical cyclones are circular. NAMING OF TROPICAL CYCLONE – WHY, HOW ? 1 Why name cyclones ? 2 How do they name cyclones ? There is a strict procedure to determine a list of tropical cyclone names in an ocean basin(s) by the Tropical Cyclone Regional Body responsible for that basin(s) at its annual/biennial meeting. There are five tropical cyclones regional bodies, i.e. ESCAP/WMO Typhoon Committee, WMO/ESCAP Panel on Tropical Cyclones, RA I Tropical Cyclone Committee, RA IV Hurricane Committee, and RA V Tropical Cyclone Committee. In general, tropical cyclones are named according to the rules at a regional level. 3 What happens to the name afterwards? Names usually retire after the event has occurred. It is replaced by a new name when it occurs again. 4 Do they run out of names? No. The World Meteorological Organization maintains the lists. 2 Heavy rainfall with flooding Heavy rainfall causes extensive flooding. 3 Storm surges Storm surge is a raised dome of water about 60 to 80 km across and typically about 2 to 5 m higher than the normal tide level. If the surge occurs at the same time as a high tide then the area inundated can be quite extensive, particularly along low-lying coastlines. An autonomous organization of the Government of India, under the Ministry of Earth Sciences, located in Hyderabad. It provides ocean information and advisory services to different strata of the society such as industry, government and scientific community through sustained ocean observations and constant improvisation of its deliverables by means of systematic and focused research. 1 Potential Fishing Zone (PFZ) This service was started by INCOIS to identify potential fishing zone so that better produce can be obtained by fishermen. 2 Tsunami Early Warning Centre (TEWS) In the aftermath of Tsunami of 2004, this system was put in place to give early signs of any possible stormsurges. 3 Ocean State Forecast (OSF) For knowing state of Ocean as India has been surrounded on three sides by water & this information is vital for its commercial activities. 4 Ocean Observation Group (OOG) The main activity of this group in INCOIS is to measure and monitor the surface temperature and salinity of the upper 2000 meters of the ocean. This system was named as Argo. 5 Satellite Data Acquisition, Processing System (SDAPS) This will help to get real time data from satellites. These real-time data help the INCOIS to predict sea surface temperature and other geophysical parameters. Triple centuries have been scored thrice only at two venues. Which of the following is the only ground apart from 'Headingley, Leeds' to have this honour?